Ho! Ho! Ho! 2016 Topps Santa Claus brings the gift-giving season to collectors with a set based on the beloved figure. Only sold through Topps, each pack includes a full base set and one signed card. 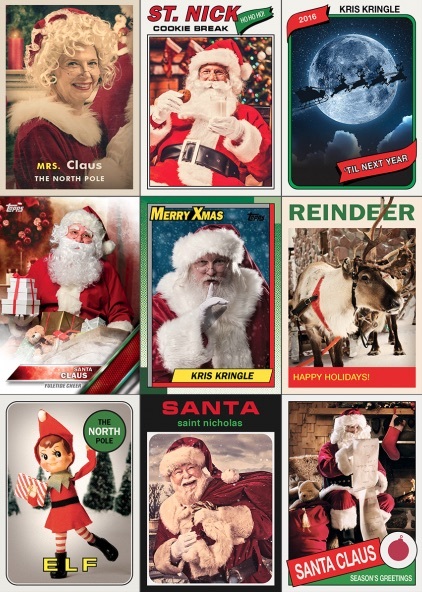 Borrowing past Topps designs to showcase an elf, reindeer, Mrs. Claus, and multiple versions of the timeless legend, the nine-card set is, of course, heavy on Santa Claus. Going as far back as 1957 Topps and all the way up to the 2016 look, the design incorporates nearly every decade in between with a holiday twist. In addition to the base set, each 2016 Topps Santa Claus Holiday Set includes a signed parallel of the base card. Autographed versions are available for every card except for the reindeer. 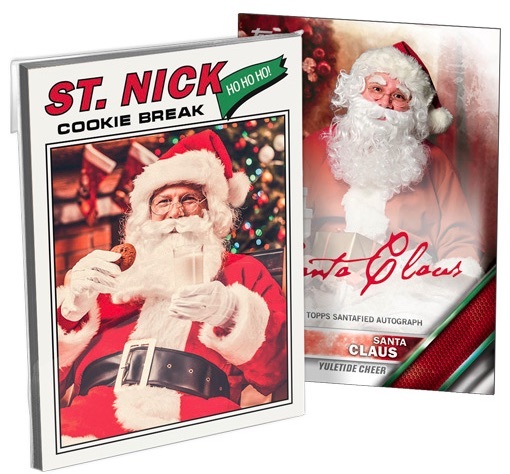 Issued directly through Topps' online store, 2016 Topps Santa Claus sells for $19.99 per set, while three-set bundles go for $49.99. All cards are printed on 28pt vintage stock. The limited seasonal release is sold until December 16. 9 cards. Shop for Santa Claus sets on Topps. Design year is listed below. 8 cards. 1 per set. I bought the 2007 set for my son a couple years ago. The “game used suit patch” card was a really nice touch. I think Topps dropped the ball not including something similar in this new release. And the 8 different autograph cards is annoying.